GreekTranscoder is free software; you can redistribute it and/or modify it under the terms of the GNU General Public License as published by the Free Software Foundation; either version 2 of the License, or (at your option) any later version. GreekTranscoder is distributed in the hope that it will be useful, but WITHOUT ANY WARRANTY; without even the implied warranty of MERCHANTABILITY or FITNESS FOR A PARTICULAR PURPOSE. See the GNU General Public License for more details. A copy of the GNU General Public License comes with GreekTranscoder. GreekTranscoder is a program which converts polytonic Greek characters written using one text encoding into another one. Its primary goal is to allow the conversion of documents using older fonts and encodings into Unicode fonts. However, it also allows converting text between older encodings as well as from Unicode into those obsolete formats. And, of course, GreekTranscoder supports Unicode, using either composed or composing characters. The program lets you choose which option you wish to apply to your Unicode text. It also lets you conform to the TLG usage regarding Unicode codepoints which, according to the TLG, should be “deprecated”. A Unicode text can be converted into Unicode itself with different conversion settings. GreekTranscoder is distributed as a Microsoft Word document template. It is programmed using Visual Basic and is available to the user as a macro in Word. macOS: Microsoft Word 2004 or later, which means Mac OS X 10.2.8 or later. This is the first version of the application that fully supports Unicode, which is required by GreekTranscoder. The program has been tested successfully under Microsoft Word 2016 (v. 15.39 or later) and macOS High Sierra. Note: GreekTranscoder is not compatible with Microsoft Word 2008, which does not support macros any longer. Note: you must update your copy of Microsoft Word 2016 to version 15.39 (or later) in order to use GreekTranscoder under macOS High Sierra. Windows: Microsoft Word 2000 or later, and Windows 98 SE or later. 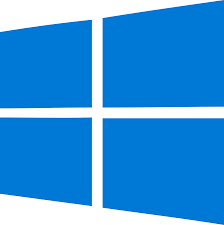 GreekTranscoder has been tested successfully with Microsoft Word 2016 and Windows 10. Note: Microsoft Word 97, although it supports Unicode, uses an older and incompatible version of Visual Basic and is not compatible with GreekTranscoder. This version of the program is released under the GPL. It means the source code is readily available: just open the template in Microsoft Word as you would any other document and launch Visual Basic Editor to access it. Note: GreekTranscoder does not support Windows “symbol” fonts; if your documents use such fonts you should register Ralph Hancock’s and Denis Liégeois’s program Antioch and use it to convert them. While Microsoft Word can’t identify encodings, it can find and replace fonts based on their names, even if they’re not installed. Then select your conversion options and press “Transcode”. See the documentation that comes with the program for more details. I have also developed a Unicode polytonic Greek keyboard configuration for “AZERTY” keyboards. It requires Mac OS X 10.2 or later, including macOS High Sierra, and a Unicode-compatible word processing program. It can produce composed characters using either dead keys (first you type the diacritics, then the letter: “῀” + “η” gives “ῆ” ) or modifier keys (“⌥” + “a” gives “ά”); as well as composing characters using combining diacritics (“ο” + “᾿” gives “ὀ”). In other words it’s very flexible. You can take a look at the layout if you want. GreekTranscoder is free. As is my keyboard layout. However, if they prove useful to you, please consider making a donation to show your support and appreciation for my work. Developing software is an expensive and time-consuming hobby, fun as it may be, and your help is very welcome. Here is a test document containing the beginning of Plato’s Protagoras transcoded into various fonts and encodings. Loading GreekTranscoder when Word starts up. Source font not in use! macOS & Windows UI issues. Running GreekTranscoder from a toolbar. GreekTranscoder and Word 2008 for macOS. How can I load GreekTranscoder into Word at startup to bypass macro-related warnings and use it as a global template? There are two ways to do that. Either designate GreekTranscoder as a trusted global template in Word (the method used to achieve that changes depending on the version of the program you’re using; in Word 2016 for macOS, for instance, you can use the “Tools > Templates and Add-ins” menu item). Or copy the “GreekTranscoder.dot” file into the Word “Startup” folder, the location of which is set in the application’s preferences. 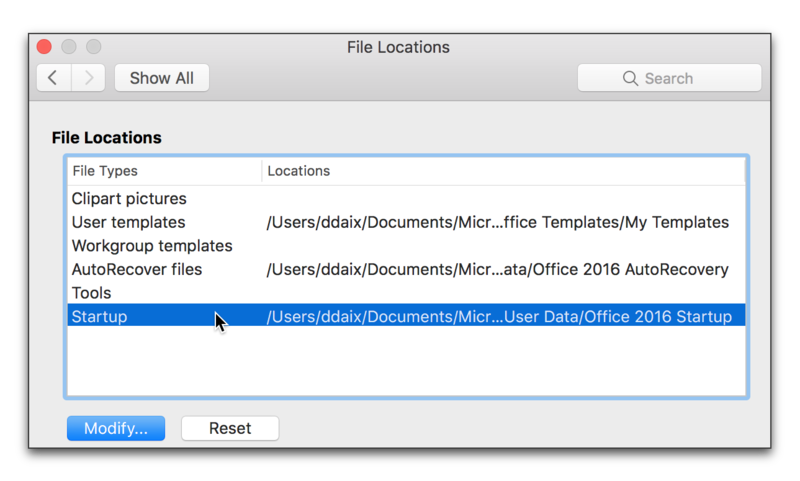 In Word for macOS, it’s very easy to find and to customize the “Startup” folder. In Word’s preferences, simply click on the “File Locations” preference pane, locate the “Startup” line, select it and click “Modify”: you can then designate the folder of your choice to act as the Word “Startup” folder. (Note that the “AppData” folder is hidden by default, though.) Once you open that folder, simply paste a copy of the “GreekTranscoder.dot” file inside. Once you’ve set the Word “Startup” folder and copied the “GreekTranscoder.dot” file into it, you must restart Word for the change to take effect. Word will then load and trust GreekTranscoder each time you start it up. GreekTranscoder can’t find the source font in the document! Word sometimes can’t locate the text that uses your source font. To solve the problem, you should replace the source font with itself everywhere in the document using a format-only “Find and Replace”. That usually works. Footnotes are not being converted any longer! When running under recent versions of Word (2010, 2013 and 2016 for Windows; 2011 and 2016 for macOS), GreekTranscoder can’t convert both the body of a document and its footnotes in one pass: if you try, only the body will be converted, while the notes will be ignored. To convert a document from beginning to end, first select all of its body and run GreekTranscoder on that selection. Then, while in “Draft View”, view and select all your footnotes and convert that selection using GreekTranscoder. Under Word 2010 for Windows, you may even have to copy and paste the notes into the body of a new document to convert them successfully. I’m using Word 2016 (or 2011) for macOS and the GreekTranscoder’s UI doesn’t get updated at all during the conversion process. The VBA implementation in those versions of Word is buggy and the GreekTranscoder’s UI doesn’t get refreshed. It’s purely cosmetic and doesn’t affect the program. Just be patient. Under Word 2016 for macOS, GreekTranscoder works quickly enough. Sometimes, when GreekTranscoder saves a copy of the original document before converting it, it brings up a dialog where the copy’s name is garbled. This issue is purely cosmetic: the ‘.xcoded’ document will have the correct name and the original won’t be modified at all. Internally, VBA doesn’t always handle Unicode characters correctly in UI elements, so if your document’s name contains Greek characters for instance, they’ll usually be displayed as underscores: “_”. I’ve installed the “GreekTranscoderToolbar” but it does not appear. Recent versions of Word that rely heavily on the Ribbon do not support custom toolbars any longer. So the GreekTranscoderToolbar can’t be used in that case. What you can do, once you have installed GreekTranscoder successfully as a global template (see above), is to assign the “GreekTranscoder” macro to a spot in your Ribbon by customizing Word’s UI (it will appear among the available macros you can install into the Ribbon or the Quick Access Menu). I’m using Word 2008 for macOS and GreekTranscoder doesn’t work. Word 2008 for macOS doesn’t support macros, so it can’t be used to run GreekTranscoder. Use another version of Word for macOS instead: 2004, 2011 or 2016. Minor UI changes to better work with recent versions of Word: in particular, the ‘Conversion Settings’ frame’s caption has been removed, since it wasn’t being displayed properly. Corrected a few typos and switched from straight single quotes to closing ones in all the captions. Removed all the user-defined styles from the ‘GreekTranscoder.dot’ templates. Updated the screen captures in the documentation. Minor UI changes to better work with Word 2016 for macOS. 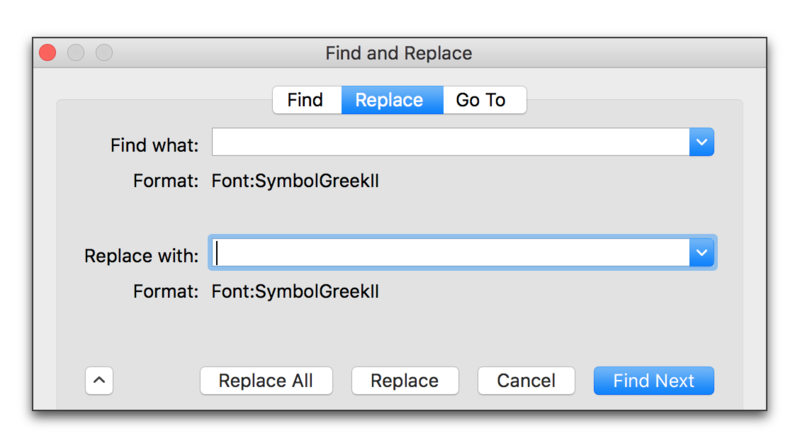 There are now two versions of GreekTranscoder: one for Windows and one for macOS (a.k.a Mac OS X), in order to properly display French accented letters in the program’s UI when used in Word for Windows. The macOS version uses the old and obsolete Mac OS Roman encoding internally and won’t display accented letters correctly when used under Word for Windows: it’s a limitation of the VBA implementation in Word for macOS (all versions). The French captions now properly use non-breaking spaces when needed. The documentation has been completely revised. Removed GreekTranscoderToolbar.dot: if you’re using an older version of Word that still supports it, you can download it separately. This version has been tested with Word 2011 & 2016 for macOS and with Word 2016 for Windows and is compatible with all three. Times New Roman (Unicode) is now a valid source and target font. Removed the warnings about using non-Unicode versions of Times and Helvetica as target fonts. The background color now used in the GreekTranscoder’s user form is a bit lighter and better matches the most recent macOS UI. GreekTranscoder is released as uncompiled VBA code to avoid compatibility issues between different versions of Office and is compiled by Word at runtime. Confirmed that Microsoft Word 2016’s VBA implementation has the same bugs as the version that shipped with Microsoft Word 2011 and requires the same workaround. People willing to make a donation to support GreekTranscoder are now sent to the program’s web site. Modified the code to work around some of the bugs in Microsoft Word 2011’s VBA implementation; however some limitations remain. In the Unicode transcoder, the ‘MATHEMATICAL FRAKTUR CAPITAL M’ and ‘MATHEMATICAL FRAKTUR CAPITAL P’ characters were transposed: the error has been corrected. In message boxes, the program now displays icons appropriate to the context if available on the current platform. The program now always reports the conversion progress accurately. When verifying and sorting composing characters’ sequences, the program now properly switches fonts if needed. When switching fonts, the ‘Convert Selection Only’ setting is now correctly taken into account. When replacing Greek characters, the program now makes sure that all the ‘AutoFormat’ options are turned off, not just those affecting quotes. The program requires Word 2000 or later, not Word XP or later, as the included warning message’s title mistakenly put it. The font previously identified as ‘ALPHABETUM’ in the default font list is now properly called ‘ALPHABETUM Unicode’. The font ‘Code2001’ shouldn’t have been included in the font list: the font ‘Code2000’ now replaces it. General code clean-up and optimization: the program is much smaller as a result, and should be faster as well. The program now systematically verifies and sorts composing characters’ sequences for encodings that use them. Providing an encoding is susceptible of such composing characters’ verifications, choosing both a source and a target font belonging to that encoding will run those checks. The program now produces pairs of surrogate UTF-16 codepoints to represent UTF-32 codepoints Word can’t insert directly rather than use other characters as substitute. Worked around a problem with Word sometimes losing track of the current selection and transcoding all the document instead. Sometimes the program would fail to color in red the characters it couldn’t transcode: it’s now fixed. When converting Beta Code texts which only use regular sigma letters, the program will now produce final sigma letters as needed. Increased the font box size in the GreekTranscoderToolbar. The Vilnius University encoding is now supported. The routine which verifies the Unicode composing characters’ sequences is now much more efficient. The default font list now includes ‘Code2001’, ‘Gentium’ and ‘GentiumAlt’, and ‘ALPHABETUM’, plus all the Vilnius-University-encoding fonts listed in the Antioch documentation. The default font list no longer includes the so-called ‘Semata’ fonts. The replacement order has been modified so that capital vowels with prosgegrammeni are now treated after the small letter iota with diacritics, but before the plain small letter iota. The transcoders have been updated and a few mistakes corrected. Improved the treatment of WinGreek quotation marks. Corrected an issue on Windows where, even if the minimal configuration was not met, the program would still load. On Windows, the program displays a smaller window and uses Arial 10pt instead of 12pt. Please send me your and encouragements: with your help, I can make GreekTranscoder an even better program. The version of Microsoft Word you are using. The operating system you are using and its version number.